Many people search a long time for a place or a group where they belong. Part of the challenge of following Christ is that He calls us to make Him the first priority in our lives. This can mean a loss of friendships or even conflict between others who do not understand or like our new found “Christianity.” Some of us have belonged to churches but have not found the type of close knit “community” we were hoping for. This discouragement can lead to us not seeking to belong to a fellowship of believers. There are others who have found the most intimate relationships with believers as they gather in small groups. New groups called Gospel or Missional Communities provide a place for not just Life Coaching and Discipleship, but also situations that provide ministry experiences and opportunities to reach out to neighborhoods and communities. Some people have found great benefit to gatherings of large numbers, where worship celebrations give energy and encouragement and notable preaching and teaching happens to many people. Contrasting this large dynamic environment we see small community based churches provide close knit relational ministry where no one is a stranger. There are different reasons for each organization and group, and each also have benefits and challenges. But whether you like big, small, city, country, monolithic or transcultural, God has no other plan than using the church to build disciples. Why does God choose to use the “church”? Just how does Jesus continue His ministry through what seems to be such a disorganized and fractured institution? Jesus knew that we would be here today! He prayed for us as well as His disciples in his last meal with them before He went to the cross. Ministries such as WDA serve the church worldwide to build Christlike character and teach those men and women to do the same, following a process and plan we see Jesus doing in His ministry. “Jesus had a plan for building mature leaders. He equipped them, addressed the obstacles that hindered their growth, and commissioned them to do the same for others. But we need to remember that these leaders fulfilled His commission by planting churches. Disciple building that produces maturity takes place in the church. The Church is God’s Plan A. There is no Plan B. Read more about how God uses the church in building Christlike maturity in believers. Sensing my confusion, he went on to say that after decades of faithful attendance, he wasn’t leaving a particular church. Instead, he was leaving church altogether. Today’s church leaders know how to teach the Scriptures, but they often don’t know how to help people like my friend grow to maturity. Unfortunately, immature people are self-centered. They can only see the world from their own narrow perspective. They fail to see the challenges and obstacles others face. And when things don’t go their way, they take their Bibles and go to another church—or, like my friend, stay home. As we mature, we are transformed. We develop the capacity to see others’ needs and display the courage and wisdom to help them—even if it means sacrifice and suffering. God demonstrated this type of love for us, and it’s also what He expects from us. Jesus summed it up by saying, “This is My command: love each other” (John 15:17). And later, “Greater love has no one than this: to lay down one’s life for one’s friends” (John 15:13). Even among Christians, that sort of love is hard to find. “Love is patient, love is kind. It does not envy, it does not boast, it is not proud. It does not dishonor others, it is not self- seeking, it is not easily angered, it keeps no record of wrongs. Love does not delight in evil but rejoices with the truth. It al- ways protects, always trusts, always hopes, always perseveres… When I was a child, I talked like a child, I thought like a child, I reasoned like a child. 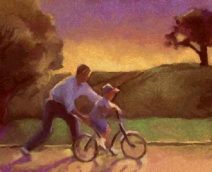 When I became a man [mature], I put the ways of childhood behind me” (1 Corinthians 13:4- 7, 11). “As I urged you when I went into Macedonia, stay there in Ephesus so that you may command certain people not to teach false doctrines any longer or to devote themselves to myths and endless genealogies. Such things promote controversial speculations rather than advancing God’s work— which is by faith. The goal of this command is love, which comes from a pure heart and a good conscience and a sincere faith” (1 Timothy 1:3-5). My friend’s been a Christian since high school, but he still needs to grow to maturity. If he does, he’ll develop a better understanding of how the kingdom of God functions. He’ll recognize his need to remain committed to and involved with a community of believers. As we address the matter of immaturity in the church, more believers will grow in the faith and knowledge of God. And as the church becomes filled with mature Christ-followers, we’ll do a better job of addressing the issues in the surrounding culture. After all, Christians are “the light of the world” (Matthew 5:14) and “the salt of the earth” (Matthew 5:13). But if we want all these things to occur, church leaders also need to make some changes. • We began with a maturity philosophy. We knew Jesus had a plan for building mature leaders. His Great Commission assumed this “pattern of sound teaching” (2 Tim. 1:13), and the early church employed it to help people grow in Christ-like- ness. Of course His plan would apply to the contemporary church, as well. 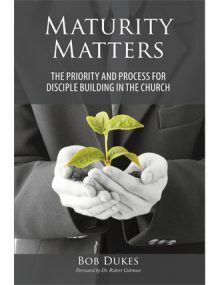 • Using Jesus’ approach as a template, we designed a process for producing maturity in the church that included a progressive, intentional architecture for growth. • Building on this process, we developed practical programs to support maturity. These can be implemented in local churches through lay leaders. • Next, we produced a progressive curriculum that provides the content and training needed to support the programs. • Finally, we built partnership prototypes in a few local churches that have implemented our process. This book represents an explanation and overview of what we’ve learned so far. We’ve reached a critical intersection. Christians need to be trained to think, feel, and act like Jesus (Luke 6:40). God commands this for the glory of His name. In addition, our culture has a desperate need for mature people. 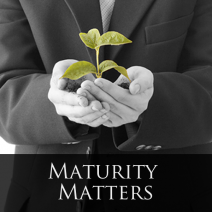 The maturation process may seem daunting and uninviting. After all, we don’t like it when someone says, “Grow up!” But living a mature life of service to others is essential. Remember the last time you encountered that rude driver or the over-zealous rival fan? What about the surly shopkeeper or the mud-slinging politician? We know maturity is important. But we don’t always understand the best way to harness the processes that produce it. We know maturity is important. But we don’t always understand the best way to harness the processes that produce it. If you’re a church leader who feels this way, you’re not alone. In this book, we’ll present practical, biblical approaches for producing maturity. As you read and study this material, we hope you’ll grow—and join a movement that urges others to do the same. Everybody needs to grow and mature, but this book is aimed at Christians who realize something has gone terribly wrong in the Western societies that once embraced biblical Christianity. These believers sense, even suspect, that underlying issues exist within the church that connect to the cultural decay and the shift of worldviews. And they’re right. God has placed the church—along with the family—at the center of the maturation process. By strengthening the church, we bolster the family and, in turn, our society. Our enemy understands this. That’s why, in our postmodern culture, all these institutions find themselves under siege. We need mature leaders who will stand against the evil one and retake lost territory in our homes and churches. I believe God is allowing time for Western cultures to repent, or at least time for His Church to prepare for hardship and increasing persecution. But since time is short and precious, we must act wisely. Most Christian leaders lead busy lives. That’s why we designed this book to be read in a few hours, providing an overview of core concepts. The Epilogue shares an invitation to join an ongoing conversation about implementing the suggested programs. Information- packed Appendices will meet the needs of those who want still more information. If you want to learn even more, we hope you’ll contact us. Today, many believers hope and pray for an outpouring of God’s grace and mercy to yield a worldwide spiritual awakening. I join them in asking God to bring into churches the kind of revival that spills into the surrounding culture. But while we wait and pray, we can also act by installing processes and programs that produce maturity. And we don’t need to choose between prayer and action. As Scripture reminds us, “The horse is made ready for the day of battle, but the victory rests with the Lord” (Proverbs 21:31; cf. 1 Corinthians 3:6). The solution to the widespread immaturity found among believers today is achievable, but not simple. A clear display of God’s sovereign rule in the hearts and lives of His followers requires wisdom and knowledge, a realignment of priorities, and an application of Kingdom principles. Leaders must understand, balance, and apply all the dynamics that contribute to progressive growth and sanctification. This requires both a strong faith and a new focus. As we fix our eyes on things un- seen, the outcome will be a deeper faith, drawn in part from church leaders who consistently equip believers. As we help them put truth into practice, faith grows. The rewards are both temporal and eternal. Unfortunately, some church leaders don’t invest the necessary effort to “equip his people for works of service” (Ephesians 4:12). Others have their own leadership agenda, one that doesn’t include maturity. When Christ returns, He will hold all leaders accountable for their stewardship. That will spell blessing for some and embarrassment (or worse) for others. But many leaders have made a commitment to honor Christ by helping His people grow to maturity. These men and women have “ears to hear” (Mark 4:9). They’ll discover and implement maturation processes within their local churches that produce Christ-like followers. They’ll celebrate the traditions that support such growth and help change any that don’t. To accomplish this maturity-minded goal, wise leaders are willing to embrace the challenge of intense spiritual warfare. I’m praying God will sound His trumpet of restoration in these dark days, calling people to “rebuild the ancient ruins and restore the places long devastated” (Isaiah 61:4). I hope you’re one of those He calls. May His grace and power rest upon you for the glory of His name. Get a copy now at the WDA Store! 1. Chaves, Mark. 2011. The Decline of American Religion? (ARDA Guiding Paper Series). State College, PA: The Association of Religion Data Archives at The Pennsylvania State University, from http://www.thearda.com/rrh/papers/guidingpapers.asp. It’s hard to believe that WDA celebrates 40 years of continuous ministry this year. Some things have changed a lot in four decades while others have remained the same. Our ministry is no longer aimed solely at college students. We still reach out to the next generation, but we’ve also built discipleship leaders in nearly 60 countries around the world, and that number is growing. And all this was launched from two college campuses: The Universities of Georgia and Tennessee. David proves that building mature leaders pays great dividends, in this world and the next. Thanks to all who have made 40 years possible and profitable. May God enable WDA to continue long after we founders have left the field!